My girls went out for ice cream with Nana & Papa Losh. Hubs and I were out with the boys so we were unaware of what had happened until it was all said and done. All was going well with the excursion until my youngest went to throw away her trash. As they went to leave, an older gentleman stopped my mother. At this point, my little Bella dissolved into tears and buried her face into my mother’s legs. So this dude was relentless. A grown man made a child cry and he was quite indignant about it. He was proud of himself even. Somehow, my mom managed to keep her composure and get the girls out before she decked the guy in their presence. Papa Losh fired off a “shut your mouth” as the bully continued his rant as they were attempting to leave. Other patrons of the restaurant sat stunned at this guy’s over the top reaction to an obvious misunderstanding. What this man didn’t know was that my girl points with her middle finger. As a matter of fact, all of my kids did when they were younger. I’m sure every parent out there can imagine my reaction to this story as it unfolded. Every part of me wanted to race to the ice cream shop in hopes that the man was still there so I could tell him what a stand up guy he was. Quite honestly, the only reason hubs & I didn’t bolt was because too much time had passed. So instead, we all fumed about what kind of human being could be smug about making a little girl cry. We all loved on Bella and explained to her that sometimes, people are just mean. After this, every interaction I saw online seemed to be people attacking each other. Fights were breaking out over politics and social movements, insults were thrown around as if they were no big deal, and people’s feelings were being hurt, intentionally. Over and over again and I couldn’t deal. I couldn’t encourage because I was so completely discouraged myself. I know without a doubt that I have hurt people. I’ve made people cry, most often the ones I love the most. In spite of this truth, I can say with complete certainty that I have never once felt good about being responsible for someone’s pain. I could not wrap my mind around the level of meanness I was seeing, first with the ice cream debacle and then online. All I could picture when watching these fights fester was my little girl’s face all scrunched up and tear streaked and the face of a stranger, grinning smugly at his accomplishment. So I withdrew. I limited my contact with the outside world and skimmed over every post that appeared inflammatory. No part of me could comprehend what would inspire satisfaction, knowing that you were the cause of another’s pain. During this time, what I’ve come to realize is, we can’t possibly understand why people hurt each other. We are meant to be empathetic, compassionate and do our best at making the world we live in a better place. My mom could have blessed that man out. I could have weighed in on the online attacks, berating the parties for their behavior. But what good would have come from that? In either circumstance, all we would have done was add to the hurt and anger and chaos. My blood still boils when I think of my baby hurting at the expense of another’s poor choices. I still can’t say what I would have done had it been me that he addressed. My heart still aches when I see friends become enemies over opposing views. All I can say at this point is that I think it’s sad to look around and see people feeling prideful about their ability to inflict pain. It does happen, often, but even in our anger, even when it’s justified, if we dissolve someone to tears, can we at least try to be empathetic? Just try,that’s all any of us can ever do. It’s been a couple months now since I finished reading Orphan Train by Christina Baker Kline that my friend, Julia, sent to me. I remember reading the above excerpt and feeling an immediate check in my spirit. With the recent events in the news, I was reminded once again of this line. Being polar opposites would not be an issue if we weren’t so quick to take offense to one another’s choices. When I peruse social media, that’s exactly what I see. People on opposing sides berating each other in attempts to defend “their side.” I’m all for a good debate, the problem is when it gets personal and turns into a name-calling show down. Just because someone doesn’t agree with you doesn’t make them an idiot. You see this in response to all manner of topics: politics, religious beliefs, parenting styles, lifestyle choices…I could go on but I’m sure you get the picture. We live in a diverse nation. 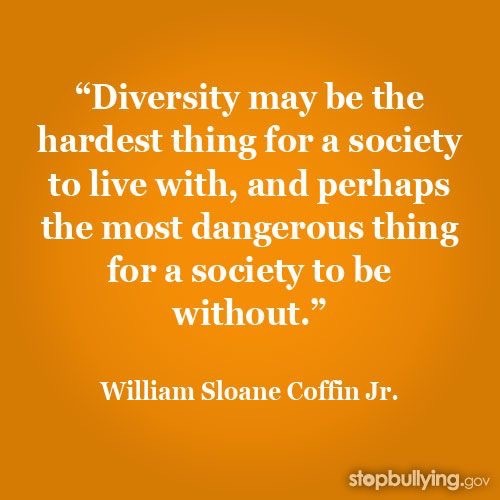 We have an opportunity to learn & grow from our differences or we can segregate ourselves, choosing to shut out anyone who doesn’t fit the same mold. I will be the first to admit that I’ve lived a relatively sheltered life. I grew up in a small, Southern town. I am NOT knocking that, I loved my small town life! However, the minority population was small and not particularly diverse as was the LGBTQ community. So it’s fair to say I’m pretty uneducated when it comes to the issues they face because I’ve not experienced it firsthand. I’m going to admit something that’s really hard to say, my lack of knowledge has at times come across as fear. Allow me to elaborate. When you grow up being the majority and having no real exposure to different cultures, all you “know” is what you watch or read. Unfortunately, there haven’t been many positive stories about Muslims, African-Americans or the LGBTQ community. I want to change that perception by doing my part to see people for who they are, not their skin tone, religious coverings, whose hand they choose to hold or any other “book covers” that would cause me to make unfair categorizations. I hope that my willingness to admit my own ignorance will open others to the same. I know I can never truly understand the level of discrimination others face. I can do better at being a friend to all and not making assumptions based on preconceived notions that have no real basis other than my irrational fears derived from biased news coverage. For those who have been on the receiving end of my ignorance, I ask for your forgiveness & the opportunity to show I can be a better version of myself. Let’s all look for ways to love one another today BECAUSE of our differences. If you have been in a relationship for any length of time in your life, you’ve likely had some variation of this conversation. I personally like to harass my husband at random by feigning ignorance and insisting on a complete rundown. The ‘how come’ is usually followed up with a list of reasons. “The list” is probably comprised of things you do or say to make your significant other feel special along with different qualities and traits they find endearing. But God loves you just because you exist. There is nothing you can do or say to add to or take away from His affections. 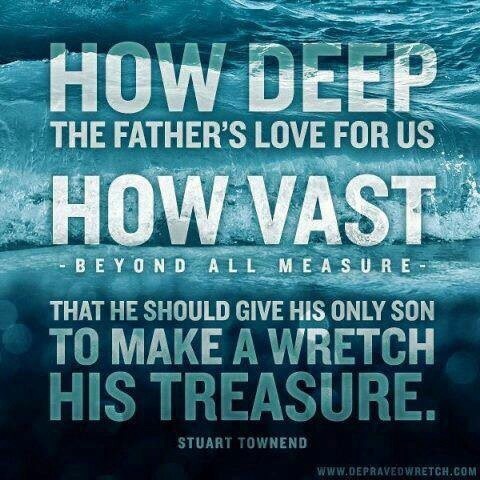 His love is everlasting, free from conditions and expectations. People can & do stop loving you, either because of something you did or because they had a change of heart. You can’t force God’s hand on this one. You can push Him away & deny His pursuits but His invitation remains open-ended. When God says “I love you” there’s no list of why attached or bullet points to be met. He simply does. All you and I have to do is accept it. Being an adult often puts us in awkward positions where we have to choose between how we want to act and how we should. Recently I was upset over something I read. In the spirit of complete transparency, I was also angry. My gut reaction was to fire off an emotional response which is exactly what I was doing when I looked over to see my 14 year old daughter. And I thought of all the times she has come to me furious or crushed over something a friend said or did to her. All the advice I had given about handling yourself gracefully and with as much dignity as possible came to mind. Don’t engage in exchanging insults. If you can’t seek reconciliation, don’t seek vengeance in it’s place. Say how you feel without making accusations. Think about what you want to say, choose your words carefully and remember once they’re out there, you can never get them back. So I stopped my rant, deleted every word, and shut it down. Anger is not a sin, but you can sin in your anger. I have failed at this very thing numerous times, when I reacted without hesitation. I still carry regrets from those moments. I’m glad my girl was sitting close by, keeping me from making yet another mistake. Thankfully, her presence was enough to remind me that I’m supposed to be setting an example here. If I had responded with a hot temper, after all the things I’ve tried to instill in her about dealing with these situations, I would be the worst kind of hypocrite. Practicing what you preach, it’s heavy, but necessary if you wish to be taken seriously. I would never encourage anyone else to be hateful, regardless of whether they felt it was warranted or not, so I had to take my own advice. 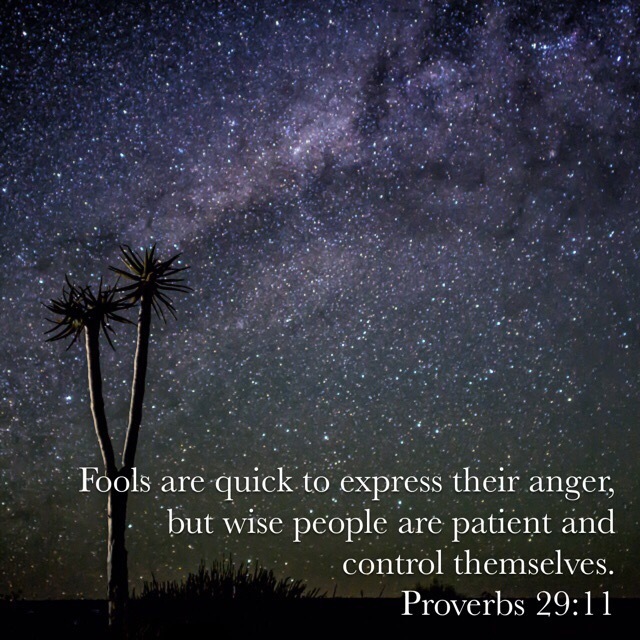 Fools are quick to anger, the wise are slow to act on it. Embrace the pause. You are not responsible for how others perceive you or how they react to what you say. You are, however, accountable for every word you speak. Yesterday I had to run to the grocery store for what felt like the bajillionth time this week. As I was dragging my youngest girls through the parking lot, we came up on a couple of older,(respectfully), ladies in what appeared to be an intense conversation. As we got closer, I realized it was one sided and the non-verbal party seemed totally detached, like she couldn’t wait to make her great escape. Just as we started to pass by, Chatty Cathy leans in, so close the other woman could probably smell what she had for breakfast, and hissed “Jesus is coming…” followed by Lord only knows what because I picked up the pace. The poor woman bobbled her head and cut her eyes with a silent plea of “get me out of here”. I’m pretty sure she wasn’t contemplating her salvation or where she was going to spend eternity. On another occasion, also quite recently, we were driving down the road and passed a dude with a megaphone in one hand and a Bible in the other, shoutin’ and shakin’ that Bible like he was about to beat someone with it. He didn’t look like a man who loved the Lord, he looked angry, mean and crazy! In both instances, I had to shake my head a little as we rushed by. What on earth about cornering someone in a parking lot and literally hissing in their face or screaming like a lunatic at a busy intersection makes someone think they’re winning souls for Jesus?! I was mortified. It is possible to share the love of Christ without trying to scare the ever-loving bejeezus out of people! In my opinion, becoming a servant as it implies here simply means to put someone’s needs above our own. I’m not of the opinion that we can never put ourselves first, doing so would seriously deplete us and prohibit us from doing any good. I do think we can all be aware of the needs of those around us and do our part to alleviate the strains and pressures that are within our means. And instead of screaming and shaking our judgy fingers at people, how about we meet them where they are and try to serve them in a practical manner. To me, trying to understand life from another’s perspective and offering hands-on assistance speaks much louder than a megaphone dripping with hellfire and brimstone. I truly believe that we can never go wrong when we choose love over criticism, judgment or hate. Seeing people who claim Christianity acting a fool in public is nothing new and there’s not a whole lot we can do about it. But what we can do is try to be a different kind of Christian, one who is more concerned with loving and helping our brothers and sisters than we are about cramming Scripture and fear down their throats. After all, not everyone will understand a Bible verse but everyone can appreciate a good deed done selflessly.